Apple‘s stock is trading 2% lower on Monday, part of a broader tech selloff led by Facebook. In addition, a small chorus of analysts says they are lowering their iPhone X sales estimates because the phone is too expensive. “Many component suppliers for iPhone X have seen very low shipments since Feb,” a note from Nomura says. Longbow Research recently sent a note to clients saying its sources inside Apple’s Asian supply chain believed the iPhone X was not selling well. 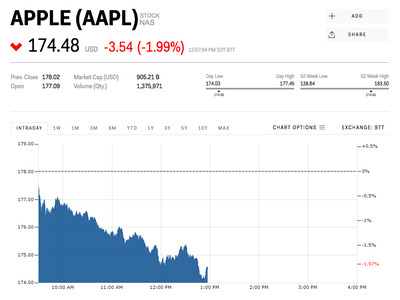 Watch Apple’s stock price in real time here.